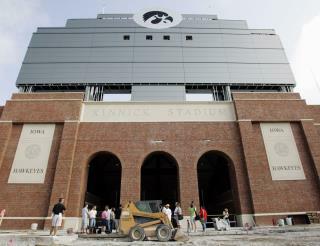 (Newser) – Iowa City residents are suing to stop a couple from building a 7,500-square-foot home that's also a replica of Kinnick Stadium, home of the University of Iowa Hawkeyes, the AP reports. The home would feature brick siding and a press box just like the actual football stadium. According to the Gazette, it would also have a sports court, an industrial kitchen, stadium-style men's and women's restrooms, and a home theater. Other planned features include stadium seating and a courtyard, KCRG reports. After three meetings and 12 hours of hearings, the Iowa City Board of Adjustment approved plans for the home Sept. 30, ruling that it met city guidelines. If these people think they are being clever by telling the city that they will be hosting "family parties" at their home the awakening they get when the liquor control board comes after that illegal bar will give their neighbors opportunity to relish all the schadenfreude they can handle. as nuts as it is you got the money go for it! they must have one hell of a big family! I finally got my permit to build a house that was a replica of the U.S.S. enterprise from start trek the original series.